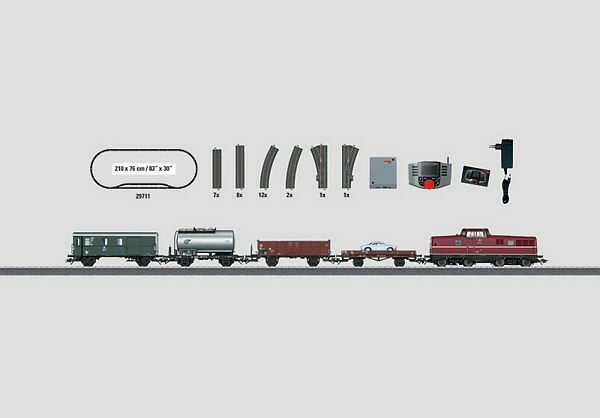 Prototype: German Federal Railroad (DB) class V 80 diesel locomotive and 4 different freight cars. The train looks as it did around 1967/68. Model: The locomotive has a digital decoder and a special motor with a flywheel. 4 axles powered. Traction tires. The locomotive has triple headlights that change over with the direction of travel, will work in conventional operation, and can be controlled digitally. Maintenance-free LEDs are used for the lighting. The train has 1 type X 05 low side car, loaded with a contemporary model of a vehicle. The train has 1 type Om 12 gondola, 1 tank car painted and lettered for VTG, and 1 type Pwgs 41 freight train baggage car. All of the cars have close couplers with guide mechanisms. A plastic kit is also included. Train length 61.0 cm / 24". Contents: 12 no. 24130 curved track, 8 no. 24188 straight track, 7 no. 24172 straight track, 2 no. 24224 curved track, and 1 pair of no. 24612 and no. 24611 turnouts. Track connector box, switched mode power pack rated at 36 VA, and a Mobile Station with a locomotive card are included. An illustrated instruction book with many tips and ideas is included with the set. This set can be expanded with the C Track extension sets and with the entire C Track program. Typical Era III train consist.